In the early 20s, young Tom Sherbourne has returned from the war to his native Australia and taken a position as lighthouse keeper at the secluded Janus Rock. After a couple of years he meets a woman named Isabel while on the mainland and marries her, bringing her to the lighthouse with him. Although they plan to have a family, Isabel suffers through one miscarriage after another. When she finally carries a baby close to term, it comes early and is stillborn. Just days after this final heartbreak, a boat washes ashore with the body of a dead man inside, and a still living infant. Tom and Isabel know they should alert the authorities immediately, but instead they take it as a sign and keep the baby as their own. As you can imagine, this plan is faulty and has dire consequences. 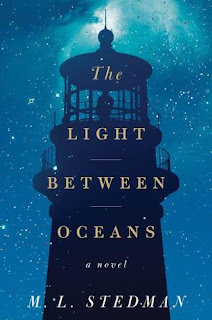 I loved the setting of this book, and everything about Tom's job as a lighthouse keeper. His job is such a unique one, and he takes it very seriously. There was something satisfying in the descriptions of his meticulous record-keeping and maintenance of the light. There aren't a lot of books set in Australia that I know about, and it was fun to read about Christmas celebrations taking place outside with various games and races for kids - what a different spin on that holiday! Although the writing was lovely, I found the storyline a bit too contrived, various events coincidentally happening with the perfect timing to create more drama. Isabel was rather an enigma to me, which is unfortunate as she is so pivotal to the book. But I could never really put my finger on her as a character. She is portrayed quite differently after all the miscarriages from when they were first married; it's taken for granted that those experiences would change her, but there were crucial aspects of this character development that were missing. I never knew whether or not her choices were in character because I didn't know her character at all. I was much more sympathetic to Tom, who I liked a great deal, and a few of the other characters who became more important later. Many people loved this book and the reviews were very strong. It's a compelling story and easy to fly through quickly, and I suppose that overall I liked it because of the setting and the beautiful, vivid writing. But all the while I was disliking Isabel, and feeling like the book was trying to manipulate my emotions in a way that was too transparent. I've got a hold on this book at the library and am very much looking forward to it. Glad you enjoyed the writing style. I look forward to hearing what you think about it!